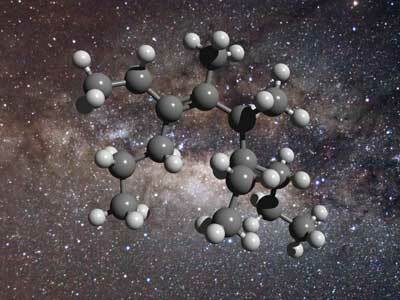 (Nanowerk News) The galaxy is rich in grease-like molecules, according to an Australian-Turkish team. Astronomers at the University of New South Wales in Sydney (UNSW), and Ege University in Turkey used a laboratory to manufacture material with the same properties as interstellar dust and used their results to estimate the amount of 'space grease' found in the Milky Way. Their results appear in a paper in Monthly Notices of the Royal Astronomical Society ("Aliphatic Hydrocarbon Content of Interstellar Dust"). "Combining our lab results with observations from astronomical observatories allows us to measure the amount of aliphatic carbon between us and the stars", explained Professor Tim Schmidt, from the Australian Research Council Centre of Excellence in Exciton Science in the School of Chemistry at UNSW Sydney. Schmidt is quick to dispel the comparison with anything edible: "This space grease is not the kind of thing you'd want to spread on a slice of toast! It's dirty, likely toxic and only forms in the environment of interstellar space (and our laboratory). It's also intriguing that organic material of this kind - material that gets incorporated into planetary systems - is so abundant."